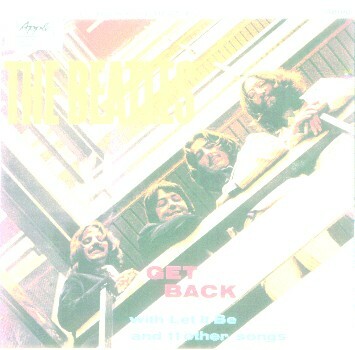 Before "Get Back" turned into "Let It Be" in 1970 there had already been 3 attempts at creating an LP with material from the Get Back-Sessions. None of these got further than printing of promotional copies and covers. Each version differed from the other in some way. "Get Back"-LP compilation # 1 "Get Back"-LP compilation # 2 "Let It Be"
Before and after the most tracks bits of studio chat were included, as this was only a rough edit of the tracks, with no intention of releasing it this way. This selection can only be explained as a quick shot from Johns. The tracks were not the best of what was available on the Multitrack-Tapes from the recordings at Apple Studios. The songs were only roughly mixed. "I've Got A Feeling (DDSI 22.71)" was a breakdown, "Teddy Boy (DDSI 24.33)" was not more than the rehearsal of a track that was new to the group. The acetate was presented to the Beatles, but there was no great interest for the project anymore. For the next single following the Get Back-Sessions more mixing was done. "Get Back" (DDSI 27.63) was edited together with an piece from a different performance (DDSI 28.1) and newly mixed. For "Don't Let Me Down" another version was taken from the Studio-Tapes (DDSI 28.2). The Acetate of "Get Back" was put to rest for the moment. But even so it wasn't intended for release, one (or more) copies of the acetate made their way out of Apple's hand to America and the recordings were aired from a local radio station in Buffalo, New York in the first weeks of September and also on Sept. 22nd by "WBCN" in Boston. From this second airing we have got the chance to hear, what was never intended to be heard by the public. The radio broadcast was the source for some vinyl bootleg's of the early seventies, like "Get Back" (Lemon Records) and "Get Back to Toronto" (IPF-1). More recently it was the source for the Vigotone-LP/CD "Posters, Incense and Strobe Candles" (including some 23 minutes of DJ comments and commercials from the original airing) and "WBCN Get Back Reference Acetate" from Yellow Dog. The last one had the recordings de-clicked and de-noised and, opposed to Vigotone's release, included only short bits of the original DJ comments from Sept. 22, 1969. The acetate-version of "Get Back" can easily be identified due to the inclusion of "The Walk", the only track not to appear in any form in one of the other LP-Lineups. "Get Back"-Acetate "Get Back"-LP compilation # 2 "Let It Be"
The studio chat included on this version was different to that on the acetate - it was well placed and sometimes even edited together from different sources (e.g. "Are we supposed to giggle in the solo" was originally said by John before "Let It Be" (Take 23/DDSI 31.29) and was cut here in front of "The Long And Winding Road" (DDSI 26.91). This version of the album was really intended for release. The song selection was well planned and it included the versions, that were thought to be the best available ones. A track by track by track rundown shows the work that had been done on it. The exclusion of "The Walk" and inclusion of "One After 909" made a good start for the album. "Rocker (Link Track)" and "Save The Last Dance For Me/Don't Let Me Down" were also new to this compilation, while "Don't Let Me Down", "Dig A Pony" and "I've Got A Feeling" are the same recordings that appeared on the first acetate. For "Get Back" Martin and Johns switched to the single mix, that was created in April from two performances. "For You Blue" was again the version already featured on the acetate. "Teddy Boy" was edited again and even though that could not change the rehearsal feeling of the recording, it was again included in this compilation. "Two Of Us" was edited a bit to remove the false starts at the begin, but was otherwise the same recording as featured on the acetate. "Maggie Mae" was included unchanged. Also new to the line-up was "Dig It", an excerpt from a lengthy jam. The version of "Let It Be", that had been on the acetate, was dropped completely and a far better take from Jan. 31 was included, announced by the film crew as "Take 27". It was the first of two "Take 27"'s, dubbed "A" and "B", with "A" being included here and "B" in the film "Let It Be" in 1970. The version featured on this album had been overdubbed with a new lead guitar on April 30, because the lead guitar was the only weak part in the original recording of "Take 27A". The last "real" track on the album was the already used version of "The Long And Winding Road". For the matter of fun there was a bit of another performance of "Get Back" included after "The Long And Winding Road", dubbed "Reprise" and also known as "laughing version", because Paul made fun of the recording during this part. The part included was actually the continuation of the part that was edited into the single mix of the song in April. 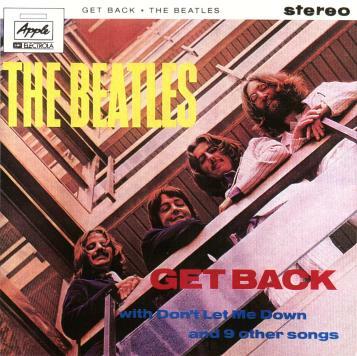 This version of the "Get Back"-Album was now ready for release and promotional copies were made, including a full cover art (see top of the page left). It was intended for release in July 1969 under the title of "GET BACK with Don't Let Me Down and 9 other songs". In July 1969 the album was rescheduled for September 1969, to appear together with the planned TV special and theatrical film about the recording of the album. In September the album was rescheduled again for December, because The Beatles had recorded "Abbey Road" in the meanwhile and wanted to release that album instead of "Get Back", in which no member of the Beatles was really interested anymore. As time went on, the film about "Get Back" was completed and it became obvious, that there were some recordings in the film, that were not featured on the already compiled album, especially the two songs "I Me Mine" and "Across The Universe". So the already completed album was shelved again and a new compilation was prepared. As it happened before with the acetate of "Get Back" it happened again with the first album version - it got out of Apple's control. The promotional copies that were sent out found their way into the hand of bootleggers. They were thankful for it, a completely unreleased Beatles album - no chance of keeping that for themselves! 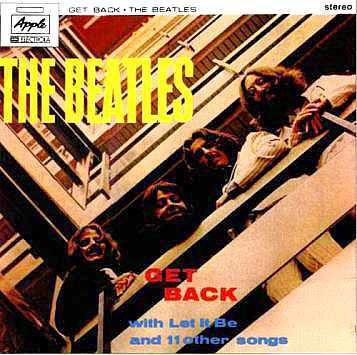 The first releases of this "Get Back"-Album appeared in the early seventies on bootlegs like "Beatles Rarest 6" (TAKRL 1995) or "Original Get Back Acetate" (Wizardo 315). These had, for unknown reasons, "One After 909" as last track on side one. The early eighties saw the release of the album the way it was intended to be, with the right track listing and even original cover art (even so this was sometimes taken from the second compilation). One album that was released this way was "Get Back with Let It Be and 11 other Songs" (Tonto TO 643). 1987 saw the release of the first compact disc bootlegs from the album. Especially "Get Back with Don't Let Me Down and 9 other songs" ("EMI/Parlophone" CDP 7 480003 2) was a great one. It not only included the original line-up and original cover art, it even faked the design of the CD itself, including the label information and order number, making it completely look like a legitimate release. Since then the second compilation of "Get Back" has appeared on various CD releases, quality ranging from worst to best, based on the quality of the original LP-source. "Get Back and 22 other Songs" from Yellow Dog brought a "de-clicked and de-noised" version of the album in 1991. There also has been a clean version from tape source (origin unknown) available for some time now, originally in part on "As Nature Intended" (VT-122) and only recently it was released in complete form as a bonus disc in the massive 17 disc Get Back-Sessions Box "Thirty Days" by Vigotone (VT-234). "Get Back"-Acetate "Get Back"-LP compilation # 1 "Let It Be"
There is not much more to say about this version of the album. The cover art wasn't changed, there was a similar photo of the Beatles, only the title was altered slightly, due to the fact that "Let It Be" was planned to be the next single. There probably were not made any more changes on the already mixed tracks from LP-Compilation # 1. "Teddy Boy" was dropped from the line-up, reasons may have been the rehearsal-feeling of the track, but more likely because Paul had re-recorded the track for his upcoming solo-album "McCartney" already. "I Me Mine" was mixed by Johns from the 1:34 Take that was made on Jan 3, with some chat from the original Get Back Sessions edited before it. For "Across The Universe" he mixed out all backing tracks and sound effects, edited a few seconds of chat before it and faded out the song at 3:24, opposing to the original mix, that was released in Dec. 1969 on the "World Wildlife Fund"-Album, which lasted 3:46 and included all the overdubs. This time the security was handled higher on Apple's side. No copies of this album slipped out for thirty years - until 1999. In the summer of this year the second compilation finally appeared on bootleg, from the Master Tapes and on two different labels at the same time - on Vigotone's "Get Back With Don't Let Me Down And 9 Other Songs - The Final Glyn John Compilation" and on Strawberry's "Get Back - 2nd Mix". With the work of Phil Spector everything was changed. The album got it's new title, a new cover was designed and there was nothing that reminded of the original "Get Back" album concept anymore. "Two Of Us" was a completely different version and in this case the choice was a good one. He left the performance itself untouched. Before the track he edited some chat from another place. "Dig A Pony" was also a different version, this time taken from the Jan. 30 Rooftop concert. This version was also better than the first choice on the "Get Back"-albums. But for unknown reasons Spector edited out the line of "All I want is you", that appeared at the intro and outro the song in it's original form. "Across The Universe" was heavily reworked by Spector. He took the original Take 8 from 1968, mixed out the background vocals and sound effects from the original take and put on an heavy orchestration and big female choir. "I Me Mine" was another of Spector's big operations. By cutting the song in little bits and putting them together again, including some parts repeated, he changed the songs original length (1:34) to a new running time of 2:24. On top of that he added some orchestration. "Dig It" was extremely edited, from the original 3:59 that appeared on the "Get Back"-LP-compilations only a little part of 0:49 was left over. "Let It Be" also was remixed and edited. Included on this version was the guitar overdub, that was made Jan. 4 1970 as well as some orchestral overdubs. There was also a part of the chorus repeated, to make the song about 12 seconds longer than the original version. "Maggie Mae" was the only thing that survived from the original Line-Up with no or very little remixing. For "I've Got A Feeling" Spector dropped the breakdown version that was featured on the first three attempts of "Get Back" and took a version from the Rooftop concert instead. The version of "One After 909" was the same as on "Get Back", but it was remixed for "Let It Be". The original dialogue in front of it was edited out. "The Long And Winding Road" got the heaviest Spector treatment on the album. The version was the same, but the overdubs, orchestra and big choir, were that much, that there wasn't much left in the mix of the original instrumentation by the Beatles. Especially Paul McCartney never liked the Spector mix of the song. "For you Blue" kept the original instrumentation, but got a new lead vocal, recorded in January 1970. For "Get Back" Spector again chose to go another way. He didn't take the single version for the album, instead he remixed the original track (DDSI 27.63) and edited some chat from the Rooftop concert (following DDSI 30.13) behind it. Spector's new attempt on the LP finally found its way to release. But by the time it came out, the Beatles had split up and no one on their part was interested in anything that was "Beatles" anymore. It was released on May 8th 1970, coinciding with the film about the sessions, now also dubbed "Let It Be".